Cassie Blake, heiress to Fenton's, San Francisco's most exclusive department store, has been married to Aidan, a handsome UC Berkeley professor, for ten years. 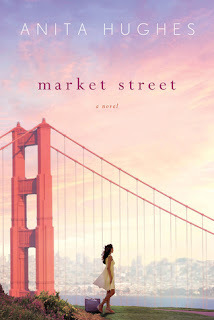 But when she discovers Aidan allowed himself to be seduced by one of his students, she moves into the third floor of her best friend Alexis's Presidio Heights mansion. Aided by the hilarious and high-spirited Alexis, Cassie has to decide if she can forgive Aidan and give their marriage one more chance. Saving her marriage is not the only choice Cassie has to make. Cassie's mother is eager to have her oversee Fenton's new Food Emporium, destined to be San Francisco's hottest gourmet shopping destination. Her true passion has always been food, and Cassie suspects her mother might be trying to lure her into the Fenton's fold by entrusting her with such an exciting opportunity. And then there is James, the architect designing the Emporium, who is quietly falling in love with her. Market Street has all the ingredients for a fun chick lit novel: plenty of shoes, shopping and fashion, a main character in crisis, a slightly crazy best friend, and an overbearing mother. I enjoyed the glimpse into the lives of the glamorous and filthy rich, but unfortunately the novel didn’t grab me as much as I had hoped. Rather than gawk at the fashion (something that doesn't really appeal to me), Market Street did entice me into running out to my local gourmet store to peruse the shelves and select delectable treats. I found this aspect of the novel so much fun to read about, but I sadly found it too short. I’ve never been one who loves to read about the infamous chick lit heroine and her shoes. Instead, I crave something more than descriptions of designer clothes and, as much as I know this type of escapism can be enjoyable at times, lately it grates on me. So if you love fashion, you may very well have a much different opinion of this novel. I might have been able to overlook the overabundant descriptions of what everyone was wearing with a heroine I loved, but unfortunately I had a difficult time with some of the choices Cassie and her best friend made regarding the men in their lives. I loathed that her bestie, Alexis, was so worried about what her husband would think about her ‘working’ and doing something she loved when he was off traipsing all over the world, leaving her at home. Cassie was in a similar boat with her husband keeping her tethered to their home and never encouraging her to do more. I hated both these men and it made me wonder about the women who loved them. I needed some scenes with Alexis’s husband to understand him and their relationship more. I think I would have been happier if Cassie had decided about her husband’s infidelity and assinine behavior instead of wavering. If she had moved one sooner and then come into her own with the food emporium, I probably would have appreciated and related to her character more. The love interest did feel a bit forced to me, but maybe that was because Cassie could never seem to make up her mind about her husband and whether she was in or out of their relationship. There were a few laugh out loud moments, and I’m sure if you’re into fashion and shoes, you’ll enjoy Market Street and maybe even if you're not. Thank you to St. Martin's Press for our review copy.